Interested in doing eye laser surgery, but put off by the idea of a blade slicing through your cornea? Is there such as a thing as no cut eye laser surgery? 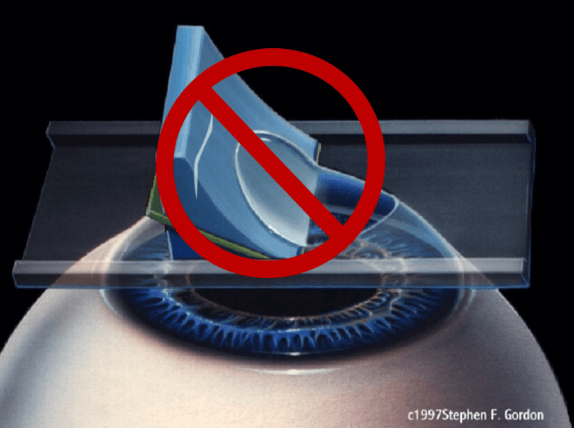 The technicality in the choice of the word “no cut” equates to no cutting of the cornea to create a flap. In traditional LASIK, the surgeon cuts the cornea surface with a blade (known as microkeratome) to form a flap, before using laser to reshape the eye to correct vision. While there are some laser eye surgery that does not involve any blades and hence the no cutting, there are actually other laser eye procedures that are considered as “no cut”, that do involve a minimally invasive cut to remove the epithelium of the cornea. According to Steinert and McColgin (2013), advanced surface ablation is the current technique used in many laser vision correction processes without the need to cut a flap in the cornea. ASA uses vaporization of the uppermost thin surface skin cell (epithelium) of the cornea instead. Common no cut eye laser surgery procedures include photorefractive keratectomy (PRK), LASEK, Epi-LASIK and Epi-LASEK. PRK was the first generation of eye laser surgery. It works by removing and discarding the epithelium of the cornea with alcohol before reshaping the eye with laser. LASEK, stands for Laser-Assisted Sub-Epithelial Keratectomy, is a modified variation of PRK. It also does not require the surgeon to cut a flap on the cornea as part of the procedure to correct vision. Although both standard PRK and LASEK utilizes an alcohol solution to debride the epithelium, there are also now techniques that uses a blunt instrument in place of the alcohol for no alcohol PRK and LASEK. Epi-LASIK and Epi-LASEK are such no alcohol procedures. Instead of using alcohol, a fast vibrating blade is utilized to remove the epithelium before laser is being used on the underlying tissue to correct vision. A recent study done in 2015 indicated that for people with low moderate myopia, standard PRK and no alcohol Epi-LASEK procedures are equally effective. However, some surgeons prefer non alcohol procedures because alcohol is toxic to the epithelial cells, and can affect cell regeneration and function, leading to longer recovery time. When Is No Cut Eye Laser Surgery Better? Very low vision correction needs (no cut procedures typically require no minimum power to proceed). Thin or irregularly shaped cornea (such as having keratoconus). Orbital anatomy consisting of a deep-set globe, high brow, and/or a narrow palpebral fissure (the anatomy makes it difficult to operate the microkeratome, thus excluding LASIK as an option). Predisposition to extreme trauma (e.g. MMA fighter). Medical history of treatment such as radial keratotomy, retinal tears or glaucoma surgery. Concerns of not wanting a flap and flap related complications such as flap dislodgement. Concerns of wanting to maintain the cell integrity of the cornea and to reduce weakening of the structure. Concerns of chronic dry eye that can be brought about by using LASIK. When NOT To Choose No Cut Eye Laser Surgery? The primary reason why the above medical conditions are contraindications is because of the potential of poor wound healing. People with existing dense amblyopia (more commonly referred as lazy eyes), are also discouraged to try procedures using the ASA method because the patient’s better eye may be compromised. People who require fast recovery time from the eye laser surgery may find the longer recovery period from no cut eye laser surgery to be a deterrent. Contrary to popular belief whereby incisions typically take longer to heal, procedures using ASA techniques usually take a longer time to heal, as compared to flap creation ones like LASIK. According to FDA, LASIK patients can usually expect to see improved vision a day following surgery, with continual improvement over the next three to six months before stabilizing. This is because in LASIK, the cornea flap is replaced onto the repaired eye tissue, and is able to rebond itself to the cornea naturally within minutes. No cut laser eye surgery procedures such as PRK takes a much longer healing time, as the epithelium cells usually take about seven to ten days to regenerate, and can be more uncomfortable as the cells heal. Thus people who are worried about prolonged discomfort associated with healing may also shy away from no cut laser eye surgery procedures. That being said, with the evolvement in ASA techniques, research have found that the newer no cut eye laser surgery procedures are enabling surgeons to provide patients with better quality of vision with less postoperative pain. No cut laser eye surgery procedures like PRK and LASEK have evolved immensely over the years, with improvement in technology, spawning newer surgery procedures like Epi-LASIK and Epi-LASEK. People who want to correct their vision, but were hesitant due to concerns about having cuts on their cornea, now have more options to do so without cuts. No cut laser eye surgery also offers the option of vision correction to people who have physical and medical conditions that make it difficult for them to receive vision correction treatments that require cutting a corneal flap. That being said, all forms of laser eye surgery carry a certain degree of risk and you should definitely consult your surgeon for a frank discussion to decide what procedure is best for your situation. And remember, success of any laser eye surgery is highly contingent on the skill of your surgeon, so do shop around and do your homework to ensure the best result for your vision correction journey!